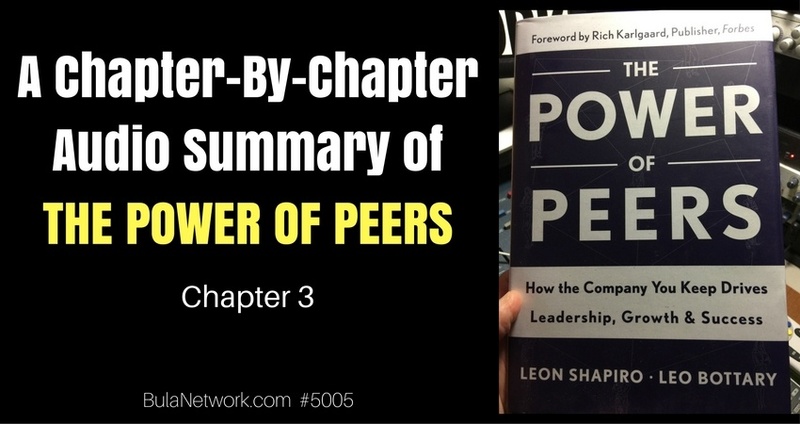 Today let’s talk about chapter 3 of the book, THE POWER OF PEERS by Leon Shapiro and Leo Bottary. This chapter is entitled – THE PATH TO PEER ADVANTAGE. This chapter is far deeper than the first two so there’s quite a lot to get to. I want you to listen carefully and make some applications so your business can benefit. And I want your life to benefit, too. We participate in 4 basic methods of peer engagement: connect, network, optimize and accelerate. Mostly we do this simultaneously in a variety of ways. Connecting and networking are mostly individual pursuits with less structure. Accelerating and optimizing are group efforts the authors call peer advantage, which makes them more strategic and structured. We use Facebook and Linkedin (among other platforms) to connect and network. When we do this we exchange information, extend our reach by introducing ourselves to more people, we contribute to the conversation, we share a common interest during some given period of time, we rely on a high volume of peers we don’t know, we share with others in an open/unsecure area that lacks safety/privacy and we participate when we want to (it’s optional). Dean Acosta is an Emmy Award-winning former journalist and press secretary for NASA who has led corporate communication teams at some Fortune 500 companies. Today he’s the global head of corporate communications and media for Phillips 66. He connects in different ways and for different reasons. Dean admits that he doesn’t buy anything online without first checking reviews. From Yelp to Amazon to Open Table Dean and his wife rely on reviews to make their choices. He also uses Facebook to stay connected with his fellow Seton Hall University alums. The Waze app helps him navigate traffic. Social connections serve him daily. Dean is also a member of professional organizations like the Arthur W. Page Society, a professional association for senior public relations and corporate communications executives. He’s also a member of a group called Page Up where he can participate in a weekly online gathering of questions and answers. He has leveraged this group for his work at Phillips 66. Dean is like many of us – he’s got many connections across a wide range of areas of his life, professionally and personally. Connecting and staying connected have never been easier. Networking is about purposeful relationships. When we network we value the power of a personal relationship to achieve individual goals – both our own and the goals of those in the network. When we network we’re seeking out our peers to help us get a job, recruit clients, create business partnerships and more. When people network we tend to not only exchange information, but work with others to create opportunities. We select peers based on specific, qualifying criteria. When we network we also recommend peers to others based on trust. We work with peers toward achieving a singular goal. By networking we understand there’s a higher degree of expected reciprocity. And we enjoy a moderately safer environment for exposing vulnerability. We also realize that participation is optional when we’re networking. Networking gets trivialized because people tend to associate it with schmoozing at events or exchanging business cards. Jimmy Fallon credits networking for his rise from struggling stand-up comic to becoming a star on Saturday Night Live, and eventually host of The Tonight Show. He first benefited from the contacts of his agent, which led to auditions for Saturday Night Live. When he got that job he made sure to forge a relationship with the show’s creator, Lorne Michaels. When Conan O’Brien left Late Night, Michaels tapped Fallon for the job. Fallon reached out to Jay Leno for advice. All along the way Fallon was earning respect because he was a good listener and true student of comedy. In February 2014 he was promoted to host The Tonight Show. Networking is about building relationships with a purpose. There’s a sense of reciprocity and that’s something you earn. It requires us to be selfless in our pursuit of our self-interests. We need each other. When we put other people ahead of ourselves by helping them…they’re more likely to help us in return. This is so pervasive there are many organizations worldwide dedicated to helping people build their personal networks. It’s the renewed purpose here behind Bula Network. To serve small to medium business owners with greater connectivity so together we can leverage joint relationships for improving our businesses and our lives. It’s the whole point of THE PEER ADVANTAGE. There are a variety of organizations across the globe serving leaders and executives. Young Presidents’ Organization (YPO) is one of the more prominent ones. In fact, just a few weeks ago we had Scott Mordell, the CEO of YPO on Leo’s podcast – YEAR OF THE PEER. Click here to watch Leo’s chat with Scott. It’s a terrific conversation. Social media gives us instant, immediate and convenient connections. It’s less time consuming and less expensive giving us a great compliment to live events. Linkedin CEO Jeff Weiner understands the power of networking. His vision is that all 3 billion of the world’s workers will have a Linkedin profile and that every company, including non-profits, will have one, too. He wants a digital representation of every available job worldwide. For professionals Linkedin is the place to go for networking. Not only can you have a profile, but you can also share what you care about and find others who care about the same things. They start the season practicing flying 45 feet apart and end the season flying in performances just 18 inches apart. Those early debriefs can last 4 hours each time. Eventually they dwindle down to 2 hour sessions and by the time the pilots are flying just 18 inches apart the debriefs are down to 15 minute sessions. Optimizing is about chasing perfection in the pursuit of excellence. That can happen in business, too. It’s not just for precision flying. You optimize when you work together in teams to bring excellence to a goal. Here’s what happens when we optimize: we work as part of a committed group to achieve a collective goal, we work in small groups or teams, we engage in an environment that’s moderately safe to share exactly what’s on our mind, we buy into the structure of the group as well as the collective goal and we realize that participation isn’t optional – it’s essential. People who work together to optimize don’t just participate in the learning process, they drive an overall standard of excellence because they help one another become better! That’s how we accelerate growth. Industry specific groups can be very valuable. We typically join them because we assume we’ll learn more and get the best advice from people who already understand the nuances of our industry. But there’s a problem. A common practice in one industry may be completely foreign to another. Stepping out of our industry into another one can offer us a perspective to help us achieve something new. People who accelerate tend to be very particular about surrounding themselves with people who share their passion and determination to achieve a goal. They tend to understand the importance of engaging with peers who have points of view and experiences unlike their own. They’re committed to helping others because that’s how they help themselves. When people are committed to accelerate they also appreciate the unexpected, positive outcomes that are realized in deep discussions. They also value a safe, confidential space where they can share their aspirations and fears. Plus, they accept that participation is mandatory and that members hold each other accountable for what they do inside and outside the group meetings. And you’ve just heard an ideal definition of THE PEER ADVANTAGE by Bula Network. It’s about accelerating your growth as a business owner so your business grows and so does your life! Visit The Peer Advantage to find out more. You’ll be glad you did. There’s big value in putting an owner of a manufacturing business in the same environment as the owner of a professional services firm, and the owner of a digital agency and the owner of a custom home builder. By broadening the definition of the word “peer” there’s a diversity that brings high value. Growth is about getting uncomfortable. I go to the gym every day. Some days I take it easy. I’m not 20 any more so wisdom prevails. But some days I know I have to push myself or I won’t benefit. Growth and improvement demand a degree of being uncomfortable. Why does the peer advantage work? When peers engage in cycles of learning, sharing, applying and achieving there’s growth. Individually and collectively. Here’s why groups that optimize and accelerate are so effective. It’s the 1st stage of the process. Sadly, for too many businesses it’s last. Learning is about demonstrating the capacity to produce quality results repeatedly. Peer groups foster application of deep learning through collaboration. Peers engage in rich dialogue and also ask hard questions – and challenge each other to tackle complex issues. Peers reinforce and give one another permission to new ways of working. Peer groups hold individuals accountable for practicing their craft and fine-tuning new ways of working. This peer-to-peer accountability is essential to the success of application of what’s been (and is still being) learned. Good behaviors replace bad ones. Achieving inspires believing. Believing fuels the hunger to learn and grow. It feeds on itself. It’s about walking the talk. Those five factors for peer advantage will each get their own chapter, but here they are in quick review. Select the right peers – it involves surrounding yourself with the right people. Create a safe environment – deep conversations can best happen when you’re surrounding by people who won’t judge you, but will listen to understand. Utilize a smart guide – every group needs a leader, somebody expert at facilitating the group’s discussions. Foster valuable interaction – deep conversations happen by design, not accident. Be accountable – being a member of a group that optimizes and accelerates well is to be part of a group where members don’t tell you what you should do, you tell them what you plan to do. Group accountability gives peer advantage its punctuation. Generally, people connect more than they network. They network more than they optimize or accelerate. CEOs and business owners, whose time is extremely valuable, should invest their energy in these peer engagement activities in the opposite order. They should accelerate, optimize, network and connect. Invest your time where you get the biggest value. Ask any high achieving, high performing business owner or CEO in a group. Peers will broaden and deepen your knowledge while helping you lead your company more effectively.